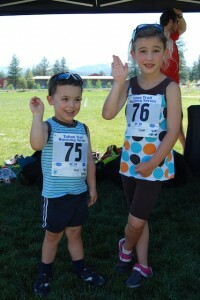 My favorite "new runners" at the Truckee Running Festival. This May I plan to run the Hippie Chick Half Marathon with a group of sisters, cousins and girlfriends in Oregon. Several of the gals are new to the sport of running, while others have been running for years but just now giving racing a try. Although I have finished over a dozen endurance races, I started running just four years ago, training for my first race, the 2008 Bizz Johnson Half Marathon. I am thus in the unique position of having some solid training experience while still having fresh memories of “figuring it out.” And don’t get me wrong, I view my running as a deliberate practice ~ a work in progress ~ where I (try) to focus on techniques for success rather than outcomes. I have plenty to work on! That being said, the sheer volume of resources available to new runners can leave them not knowing where to start. Here are some ideas. I hope some will work for you or a new runner in your life. I am a mom, but not yours! These are my ideas and opinions – use your own judgement. You take full responsibility for yourself when using any information found on this website. Believe it or not, there is actually debate about this! (I read this lengthy article about running form in Runner’s World last June.) The good news is that a new runner doesn’t have an existing form to break, so there should be no harm in starting out on the right foot (pun intentional). Three factors have helped shape my running form: ChiRunning, using minimal shoes, and seeking professional help. Last year I went to a ChiRunning workshop. It changed the way I run, improved my relationship with running, and increased my confidence in experimenting with my own running form. I started with the ChiRunning book, but quickly realized that I didn’t have the body awareness to master the keystone of all movement: proper posture. The workshop was a wonderful experience and I recommend it for any level of runner. Moving from bulky motion-control shoes and custom orthotics to light “racing flats” that weigh less than 10 ounces has greatly increased my balance and strength in many respects. If you are headed out to buy your first (or next) pair of running shoes, definitely consider going with a more minimal shoe, then ease into them slowly. Browse RunBlogger.com and read this article about minimal shoes to learn more. Still not convinced? Even some podiatrists are coming around, as evidenced by this article in Podiatry Today. Finally, don’t hesitate to seek professional help if your budget allows. I have been fortunate enough to be able to work with a great physical therapist (PT) and a movement instructor who also happens to be an amazing massage therapist. My PT, Scott at Tahoe Synergy, was the first to point out that I had no idea what to do with my arms when I run. Really. (Hint: bend your elbows 90 degrees and don’t let your hands cross your midline.) Meanwhile, my massage therapist and movement guru Jen Fluharty at Full Circle Movement, is teaching me breathing and posture exercises to complement my ChiRunning practice. Since my Dad worked in a steel foundry, I have a fond recollection of the mandate, “Injury prevention is job one.” But when the aches and pains do crop up, do your best to take care of them. Learn how and when to use ice and heat. Avoid chronic or preventive use of ibuprofen, or “Vitamin I,” as it is called by the many athletes who abuse the drug. (Read this article in Trail Runner Magazine about the danger of kidney failure.) Instead, try Traumeel, a topical homeopathic cream that is a very effective anti-inflammatory and pain killer. For chronic issues, you will ultimately need to address the strength and/or technique deficiency that is causing the problem, but massage can help release tight muscles and tendons. As most of us can’t afford to have a massage therapist on staff, self-massage with the appropriate tools is they way to go. Trigger Point Technologies has pioneered wonderful tools and instructional programs to this end. Their flagship product, The Grid, is an alternative to traditional foam rollers and is great for massaging tight hamstrings, IT bands, quads, and more. I have also used the Foot & Lower Leg Kit for successful relief from foot issues. As your runs reach the 60 – 90 minute mark, it’s time to start learning about how to fuel your machine. You will most likely need water, calories, and electrolytes. This means that you will need a way to carry said fuel (unless you are running laps or have a overly-dedicated spouse who will drive around in a sag vehicle). When you get to this point, do some research and experiment to find out what you need and what works for you. Maintain one or two other aerobic sports that you enjoy in addition to running. It can be anything, but some examples include: cycling, swimming, paddle boarding, cross-country skiing, hiking, and even brisk walking. From a physical point of view, the primary benefit of cross-training is keeping your cardiovascular fitness while giving your running muscles a rest. But for me, the greatest benefit is mental. Weeks (or months) on-end of running can wear on you mentally, especially if you are so tied to your training that you can’t hop on the bike and go for a ride with friends. Cross-training is also a life-saver when you are reducing mileage for a race or due to injury. Try to do something other than running, preferably once or twice a week. A training log can be as simple as a notebook (or text document) with a list of dates and brief run descriptions. Try to include at least one metric of duration (time or distance) and intensity (e.g. “went easy” or “powered up hills” and/or the actual pace). As a techie, I like to use Google calendar for both planned and actual workouts. If race plans are in your future, your training log can provide comforting reassurance that you are ready to toe the starting line. Your log is also a helpful tool if you seek outside coaching down the line. Instead, I prefer to do joint-loosening movements that I learned from ChiRunning. If you feel that you just must stretch your muscles, wait until the end of your run, then stretch your toasty-warm muscles. Leg drains (see step 6 in this article) and cold plunges are other post-run techniques that I use to help reduce inflammation and speed recovery. Finishing your first race (of any distance) is a huge accomplishment. Getting to the starting line well-trained and injury-free is key. Not meeting a goal time can be really disappointing (trust me!) and can take away from the excitement of running and finishing your first race. If you are doing an endurance race (half marathon or longer,) then it is helpful to have a general idea of your projected pace, in order to help manage your pacing. Marathon race paces are typically 60-90 seconds/mile faster than a comfortable long training run pace, with weather, elevation and hills being contributing factors. “Jogging” is so 1980. Regardless of your pace, you are a runner now. Own it. Now get out and go for a run! Oh, but take a minute to leave a comment first! Experienced runners: what advice do you have? New runners: what tricks have you discovered on your own? Relax your shoulders–tight shoulders drain energy and are uncomfortable–learn to let them sag. Also, try not to run with a tight fist–either loosely closed or even open. I like to run to music but that is obviousoy a personal choice but running with only your inner thoughts can become boring especially on your long runs. John, thanks for the notes! Found your blog, great tips.